The meanings of these twelve Names and those of some others are given ahead. Generally, it is considered that Vakratunda means one with a curved, crooked mouth or trunk; however, this is incorrect. According to the Sanskrut saying ‘वक्रान् तुण्डयति इति वक्रतुण्ड: ।’, ‘Vakratunda is the one who punishes those following a crooked (meaning, unrighteous) path and thereby brings them onto the straight (meaning, righteous) path. Vakratunda is He who straightens the tiryak and visphutit meaning, the crooked Raja-Tama predominant 360 waves through the medium of His trunk and makes them straight, sattvik (Sattva-predominant) like the 108 waves. Shri Ganapati bears this Name because He has only one unbroken danta (Tusk). Of the two tusks, the right one is whole, while the left one is broken. A. The right side represents the Suryanadi (Sun channel). As the Suryanadi is radiant, the tusk on this side can never be broken. B. Ekadanta is symbolic of the one and only Brahman (God Principle). D. Medha and shraddha (Faith) are the two tusks. ‘Medha’ means intellect, the ability to comprehend. Medha is the incomplete (broken) tusk and shraddha is the complete one. A. ‘Gaja’ means cloud, and is considered to be the representative of the dyu (द्यु) region – the region of the Deities. ‘Vaktra’ means mouth. Thus, He whose mouth is the dyu region is the Gajavaktra, meaning, one who is enormous. If Om is placed vertically, we get the experience of Gajavadan (or Ganapati). B. Mudgalpurana explains the meaning of the word ‘gaja’ as ga = the Principle wherein everything undergoes Dissolution and ja = the Principle from which everything originates. Hence, ‘Gaja’ means Brahman. The word ‘Lambodar’ is formed from ‘lamba’ (Large) and ‘udar’ (Belly). B. According to the Ganapatitantra, Deity Shiva played the damaru. Shri Ganapati grasped the knowledge of the Vedas through the deep sound of the damaru. He learnt dancing by watching the Tandavnrutya (Cosmic dance) of Shiva everyday. He learnt music from the sound of the anklets of Paravati. He imbibed, meaning, digested such varied knowledge; hence, His belly became large. Vi (वि) + krut (कृत) + akat (अकत). 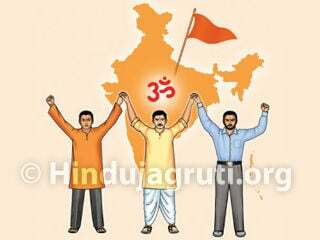 ‘Vi’ means in a specific manner, ‘krut’ means done and ‘akat’ means Moksha (Final Liberation). Hence, ‘Vikat’ means He who generates waves in a specific manner and bestows Moksha. Vighna (विघ्न) + Ish (ईश) = Vighnesh (विघ्नेश). The word ‘vighna’ is derived from the Sanskrut term ‘Visheshen ghanati’ (especially the distress). The Ish (God) of obstacles, distress, meaning, He who controls and destroys obstacles is Vighnesh. The obstacle in this context refers to getting surrounded by the 360 (Raja-Tama) and 108 (Sattva) waves. This is against a devotee’s aim of becoming trigunatit. The word Isha (ईश) is a combination of I (ई) + sha (श). I (ई) denotes ikshate (ई-इक्षते), meaning, to watch and sha (श) denotes shamayate (शमयते), meaning, to cool down. Thus, Isha is He who keeps a watch on and destroys the heat generated by the 360 and 108 waves. Vighnaharta (Vanquisher of obstacles) is another Name of Shri Ganapati. Since Shri Ganapati gets rid of obstacles, He is worshipped before performing any auspicious religious ceremony. ‘Dhumra’ means smoke and ‘varna’ means complexion. Smoke is the transitory state between sagun (Materialised) and the nirgun (Non-materialised). He who possesses such a smoky complexion is known as Dhumravarna. According to the principle of ‘where there is smoke, there is fire’, Shri Ganapati definitely possesses the Fire Principle. ‘Bhala’ means the forehead. The waves arising from Prajapati, Brahma, Shiva, Shrivishnu and Meenakshi intermingle and from them many groups comprising of thousands of waves are generated. Though Prajapati, Brahma, Shiva, Shrivishnu and Meenakshi are all nirgun, their waves have components. From among these, the point of origin of three of these waves, namely, affection, mercy and motherly love is referred to as the Chandra (Moon). He who adorns such a Chandra on the forehead is Bhalachandra. Actually this is the Name of Shankar (Deity Shiva). But since Shri Ganapati is His son, He, too, acquired this Name ! According to Sanskrut, the word ‘Vinayak’ is derived from ‘Vishesharupen nayakaha’. It means He who is endowed with all the features of a nayak (Leader). ‘It is universally accepted that there are six Vinayaks. The summary of information on Vinayakgana (Attendants of Vinayak) given in the Manavgruhyasutra and Boudhayangruhyasutra is that the Vinayakgana create obstacles and are troublesome and cruel. When they start harassing, people begin to behave as if insane. They get nightmares and are constantly under some fear. 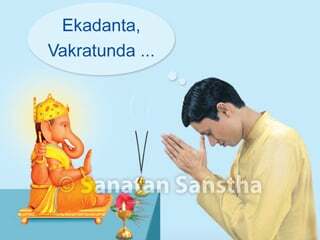 To overcome these obstacles posed by the Vinayakgana, the scriptures have advocated various rituals known as Shantividhi. 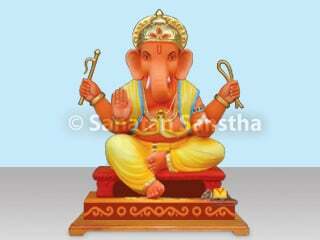 Shri Ganapati is Vinayak, meaning, the master of these Vinayakganas. Deity Shiva said to Shri Ganapati, “The Vinayakgana will be your servitors. You will be worshipped first in various rituals like Yadnyas (Sacrificial fires) etc. If anyone fails to do so, they will face obstacles in their rituals”. From then on, Shri Ganapati’s worship at the beginning of an auspicious ceremony came into existence. The Vinayakgana were obstacles personified; but Vinayak became the eliminator of obstacles. 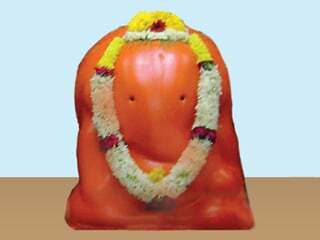 He became Siddhivinayak, that is, bestower of abhishta (Desired) siddhis (Spiritual powers). 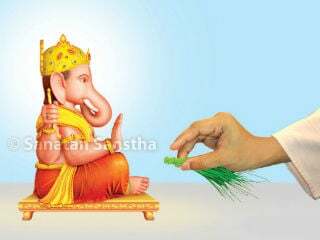 Gana (गण + pati (पति) = Ganapati. As per the Sanskrut language, Gana means a ‘pavitrak’. A pavitrak is the subtlemost particle of Chaitanya (Divine consciousness). ‘Pati’ is the master. Hence, ‘Ganapati’ is the master of pavitraks. ‘Gaja’ means an elephant and ‘anan’ means countenance (or face). Thus, Gajanan is He whose countenance is like that of an elephant (and whose body constitutes the entire universe). ‘Chintamani is another Name of Shri Ganapati. Kshipta (Insane), mudha (Stupid), vikshipta (Whimsical), ekagra (Closely attentive) and niruddha (Having restraint) are the five attributes displayed by the subconscious mind. He who enlightens on these attributes is Chintamani. Devotion unto Chintamani destroys the five attributes of the subconscious mind and complete Shanti (Serenity) is attained.’ – Mudgalpuran. ‘Mang’ means complete, or in entirety, and ‘glugayate’ (in Sanskrut) means He who bestows peace or purity. That which purifies both internally and externally is mangal (Auspicious). An Idol that endows auspiciousness is ‘Mangalamurti’. In Maharashtra, the phrase ‘Mangalamurti Moraya’ is used to proclaim Shri Ganapati’s glory. The word ‘Moraya’ is taken from the name of a famous devotee of Shri Ganapati in the 14th century, Moraya Gosavi from Chinchawad, near Pune in Maharashtra. Thus, this proclamation depicts the inseparable bond between God and His devotee. ‘Uma’ is Paravati and ‘phal’ means product. Shri Ganapati acquires this Name as He is the product, meaning, the son of Paravati. ‘Umaphal’ also means spiritual knowledge. Shri Ganapati is the Deity of spiritual knowledge. So the Name ‘Umaphal’ befits Him in both ways. 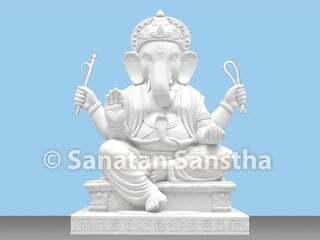 Shri Ganapati is the master of the 18 vidyas (Knowledge) – 1. Shiksha, 2. Kalpa, 3. Vyakaran (Grammar), 4. Nirukta, 5. Jyotisha (Astrology), 6. Chhanda (Science of prosody), 7. Rugveda, 8. Yajurveda, 9. Samaveda, 10. Atharvaveda, 11. Purva-uttarmimansa, 12. Nyaya, 13. Puranas, 14. Dharmashastra, 15. Āyurveda, 16. Dhanurveda, 17. Gandharvaveda and 18. Nitishastra. Hence, before commencing the study of any of these or in the ritual performed for their study, ritualistic worship of Shri Ganapati is important. The Vedas are referred to as Brahman. They may also be termed as Vedabrahman. Shri Ganapati is the master of the mantras in these Vedas. Hence, He is known as Brahmanaspati. 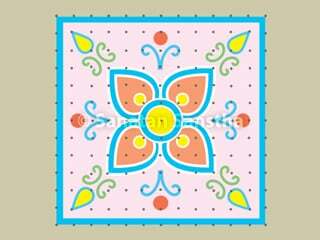 We find that Shri Ganapati is known by different Names in different regions. He is known as ‘Pillaiyar’ in Tamil Nadu. In Nepal, He is known as ‘Suryaganapati’, in Myanmar (formerly Burma) as ‘Mahapini’, in Mongolia as ‘Dhotkar’, in Tibet as ‘Ekadanta’, in Cambodia as ‘Pradganesh’, in the Java islands as ‘Kalantaka’, in China as ‘Kvanshitiyik’, while in Japan He is known as ‘Vinayakasha’. 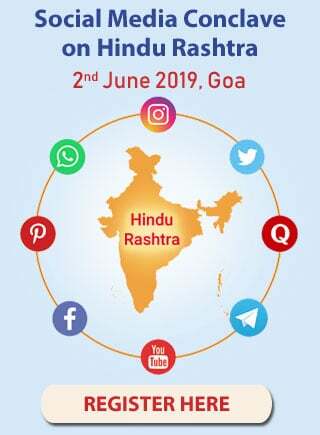 Reference : Sanatan Sanstha’s Holy text ‘Shri Ganapati’. 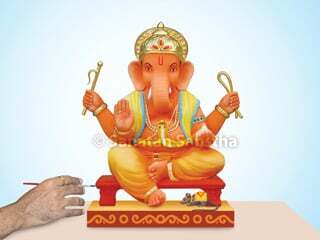 What is the ideal way of making Shri Ganesh Murti (Idol of Shri Ganapati) ? Principle of multiplication of Creation. One of the five Principle Deities (Panchadēvatā). A sacred text of Hindus that contains formulas to be sung by the officiating priest. 1. Subject dealing with moral values 2. Code of ethics.